Hello. I'm the Queen and Supreme Goddess of Bermtopia. And I'm an ice-aholic. The first warning signs of ice addiction emerged when I was a child. 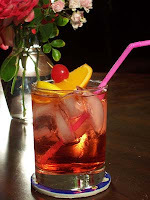 When we went to restaurants, I loved to fish the ice out of my Shirley Temple and crunch on it (well, after the maraschino cherry, that is). Ditto for water glasses. Drove my parents crazy. As I grew older, it was "Would you like a little diet Coke with your ice?" And even today, as much as I love a good G & T during the summer, a good jolt of ice is just as important as the Bombay Sapphire. Which brings me to my present state of addiction. Since my foot surgery March 25, I've basically been one large ice pack. It seems Nerve Central for your foot is based around the ankle. Apply ice to that sweet spot and you are pain free for hours, and I seriously mean hours. BUT -- when the ice pack reaches room temperature, which usually occurs around 2 a.m. when the Wonderfully Patient Spouse is in a well-deserved-hard-earned-deep-sleep-that-I-don't-want-to-interrupt-over-the-frivolous-issue-of-a-warm-ice-pack, is another story. I will go on record that I have a high threshold for pain. It's a Scandinavian thing. But what happens once the ice pack reaches room temperature isn't exactly pain. It's more like The Ultimate Annoyance -- persistent, forceful jabs of energy, like dozens of tiny jolts of electricity, laser-locked on the nerve endings in my foot. Pretty soon my foot is bouncing around the bed around like a possessed potato in an Ace wrap -- and I'm thinking Need. Ice. Must. Get. Ice. I really don't want to wake up the WPS -- nor do I want to gnaw my foot off at the ankle just to get a good night's sleep. Therefore, I activate the time-honored Ice Addict Emergency Management Plan: I flip on the light and clunk down the hall to the bathroom. Inevitably, this evokes a physiological sympathetic response in the WPS. (Seriously. This kind of stuff happens all the time afer 35 years of marriage.) Once he's completed his own midnight pit stop, he sticks his head in my room and says, "Need anything?" "Oh, an ice pack, if one's handy." I'm shameless. And I'm an ice-aholic.